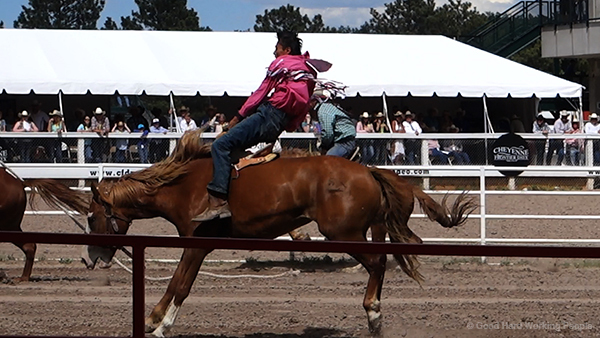 The Cheyenne Frontier Days in Cheyenne, Wyoming, is an annual 10-day outdoor rodeo and Western celebration in July. It claims to be the “Daddy of ’em all” and is super fun! While my cousin Annick visited this week with her husband Sebastien and their children Cleo and Liam from Brittany, France, we got enjoy the last day of this year’s event (which includes the PRCA Rodeo Finals) and show my French family this authentic Western tradition. And yes, this was also my first rodeo. While we missed out on the nighttime concerts and the Indian Village, which closed early on Sunday, we had a blast watching bull riding, women’s barrel racing, the bronc riding, (I have mixed feelings about the steer wrestling), eating funnel cake, drinking Colorado beers, trying on cowboy hats, learning how to lasso, and the carnival midway rides. The music in this video is the instrumental version of the song “Water In The Creek” by Josh Woodward. This song is licensed under a Creative Commons Attribution 3.0 US License.